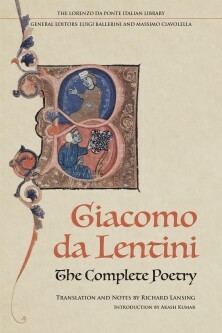 This volume presents the first translation in English of the complete poetry of Giacomo da Lentini, the first major lyric poet of the Italian vernacular. He was the leading exponent of the Sicilian School (c.1220-1270) as well as the inventor of the sonnet. Featuring illustrations and new English translations of some forty lyrics, Richard Lansing revives the work of a pioneer of Italian literature, a poet who helped pave the way for later writers such as Dante and Petrarch. Giacomo da Lentini is hailed as the earliest poet to import the Occitan tradition of love poetry into the Italian vernacular. This edition of Giacomo fills a gap in the canon of translations of Italian literature in English and serves as a vital reference source for students as well as scholars and teachers interested in the literature of the romance languages.